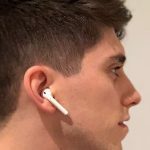 On December 13th of 2016 Apple broke new ground in audio with the introduction of its wireless AirPods. A pair of Bluetooth earbuds that, uniquely, were not wired together, communicating wirelessly not only with the music source, but also with each other. A radical new idea? Not quite. It’s something standard NHS hearing aids have been doing for over a decade. And in at least one important respect Apple’s new AirPods were a step back from the way the audio industry is moving. Rather than advancing so-called “HiRes” audio, the sound quality of Apple’s new introduction was inexorably limited by the restrictions of Bluetooth. This effectively confines audio delivery to CD quality, irrespective of the rating of components in the rest of the chain. Apple’s lead has been followed by other audio manufacturers. Among them, NuForce, a Californian company that was acquired in 2014 by the Taiwanese AV manufacturer, Optoma. OPTOMA’S BE FREE8s ARE small, independent earpieces with dynamic drivers designed to lock into your ear canals with no external support or wiring. The left earpiece communicates with your music source using Bluetooth, and the right earpiece connects with the left through near-field magnetic induction (NFMI). More of that later. Bluetooth is a low-power transmission system, and NFMI is ultra-low-power. 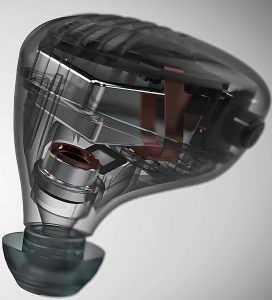 The dynamic drivers are miniature loudspeakers using not much electricity to push tiny volumes of air around. But the juice has to be there. Of necessity the batteries in these things are minute (although the claimed four hours on a full charge—verified in our tests—is impressive). The BE Free8s use the same solution as Apple’s to the problem of battery capacity—they are provided with a storage case that contains a larger battery. Whenever the BE Free8s are stowed away their individual batteries get recharged from the mothership case. The mothership battery, which holds enough juice to recharge the earbuds three times, in turn is charged using a USB cable in the usual way. The case uses the now obsolescent but still ubiquitous microUSB connector. Flipping open the lid triggers a set of three pin-hole sized white LEDs set into the bottom of the case. If all three are lit, the case battery is fully charged. A similar pair of LEDs in the side of the case give you a rather less precise indication of the charge of each individual earpiece. Stylistically, the BE Free8s improve on Apple’s offering. Devoid of the distinctive downward-extended stems that make the AirPods look like nothing so much as a pair of Oral B electric toothbrush heads hanging out of the user’s ears, the BE Free8s fit snugly into the ear canal with no extrusions. The absence of the stems makes the BE Free8s less likely to be dislodged from your ear. However, the smaller, black (there’s no colour option) buds will be harder to find if you lose them. 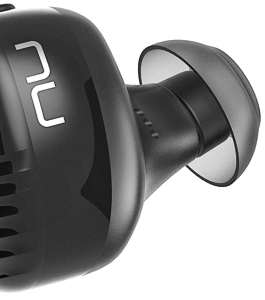 Like other earbuds designed to exclude external sounds, these need a good seal onto the ear canal. The very best way to do this is to use connectors (expensively) tailor-moulded to your own ears; in default of this the flanged silicone connectors supplied by Optoma (in the different sizes) do an excellent job. An air-tight seal allows small dynamic transducers to deliver a powerful bass—with a restricted volume of air to move they are literally punching well above their weight. The seal also acts as a (for most of the time) useful noise isolator from the outside world. Perfect, for example, for traveling on London’s noisy Underground. Contraindicated, though, if you’re navigating through traffic on a bicycle. The seal can also be a problem when you’re running, or even just walking. Your footfalls tend to travel up your body and resonate in the earbud-sealed aural cavity. If you find this annoying, headphones might be a better bet. The flanged connectors that make the seal are also very secure. 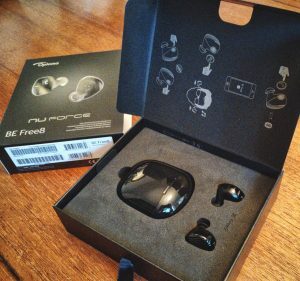 I would normally be nervous about losing costly earbuds like these, but Optoma’s connectors lodge themselves firmly—I was confident enough, for example, to wear them while washing my hair in the bath. (Yes, they’re IPX5-rated). Apropos, I thought the waterproof Monster SuperStar Backfloat Bluetooth speaker delivered a pretty good audio bath performance. But until you’ve bathed with the BE Free8s unveiling a panoramic soundscape of Arvo Part’s Kanon Pokajanen, you ain’t, as they say, heard nothing yet. IPX5 offers protection from moderately powerful water jets coming at it from any direction. You’ll be OK in a shower, but don’t try snorkeling in your Be Free8s. The left hand earpiece is the master, in charge of pairing, playback control and phone calls. After holding down the left earpiece button for four seconds its LED indicator flashes orange and white to indicate it’s in pairing mode. You’ll also get a voice message to confirm this. The BE Free8s are supposed to be able to remember up to eight different Bluetooth pairs. In practice, I found I had to unpair and re-pair with the nVidia Shield each time I came back to it. It was the same story with the Yamaha RX-679 AV receiver. But once paired to the Huawei Mate 9 the earbuds managed to latch on its Bluetooth signal immediately each time. Pressing the button on the right hand earpiece opens up the near-field magnetic induction (NFMI) link between it and the left hand earpiece. NFMI is emerging as the preferred physical path for wireless body-area networking (WBAN), a key component of many modern healthcare devices. Designed to communicate only over very short distances and highly resistant to interference, NFMI operates in the megaherz rather than Bluetooth’s gigahertz spectrum, with a power consumption that is an order of magnitude less. With the earpieces installed, I found these two buttons quite fiddly to negotiate. To press one with your index finger on top you need to steady the earpiece with counter-pressure from your thumb below. It was difficult to do this without displacing the earpiece from the ear canal, and this made it hard to discern the confirmatory messages (like “Pairing” and “Primary device connected”). Optoma would probably argue that this was a necessary design consequence of keeping the devices small, and I wouldn’t pick a fight with them on this account. The earpieces turn themselves off when you put them back in the case, or you can hold down the left earpiece button for four seconds until the LED indicator turns orange and you hear “Power off” in a female British accent. Sensing shutdown of the NFMI link, the right earpiece will automatically shut itself down. When listening to music a single tap on the left earpiece button toggles pause or play, while a double tap skips to the next track. There’s no way of returning to a previous track. Tapping the left earpiece button once will answer or hang up a phone call. Holding the button down for two seconds opens up the microphone for you to talk to Siri or Google Voice, with a single press on the same button shutting the mic down again. I tested this (see box) while writing this paragraph, interrupting Frank Sinatra playing into the BE Free8s from my Huawei Mate 9. And it takes some practice to get feedback through the microphone working properly. Apart from the physical fiddliness of the button-pressing, timing is also essential. Too short a press is read as a click, an instruction to pause the music. Too long a press powers down the earpieces. The small dynamic transducers in devices like the BE Free8s have their necessary physical limitations. Conventional dynamic headphones should be able to deliver wider frequencies and volume range for the same or less money. And Bluetooth imposes its own sonic limitations. Bluetooth communication has always relied on codecs at each end of the chain to squeeze the audio signal to fit the bandwidth. Its standard codec, SBC was designed to use minimal processing power, and—originally—had its work cut out cramming audio into a tight pipeline. 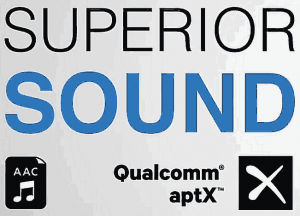 As Bluetooth processors developed more oomph, new codecs came into play, including Apple’s lossy AAC and Qualcomm’s rather less lossy aptX. Both these higher quality codecs are incorporated into the BE Free8s, although your Bluetooth transmitting device will need them too. Otherwise the transmission will fall back to SBC. But with today’s improved Bluetooth processors and much wider bandwidth SBC scales itself up to do a very decent job. Its most noticeable drawback in the old days, failure to keep in sync with video as it struggled to encode and decode, is usually not a problem now. So although the use of Bluetooth delivering into dynamic transducers precludes the BE Free8s from the lofty heights of “HiDef”, if you’re a plain music lover, rather than an audiophile, there’s little to complain of. You’ll find the physical construction and wireless implementation of the BE Free8s are a very good match, certainly able to deliver very acceptable CD audio quality. Used for on-the-go, outdoor sound delivery—their design intention—they’re hard to fault. Because the flexibility of a wireless link doesn’t guarantee you’re near to the device delivering the signal, it’s usual for Bluetooth headphones to have their own local volume control. An additional advantage is that by keeping the volume control on the analogue side of the digital-to-analogue converter the noise floor remains low and doesn’t interfere with the signal. But the very rudimentary physical controls on the BE Free8s—just a single push button on each earpiece—preclude this feature. Optoma tells me that volume control was omitted to keep the bulk of the earpieces to a minimum. You probably won’t miss this if the source device is near at hand—your phone, say—or if you’re listening to a media centre like the nVidia Shield, which has its own remote volume control. But an AV system like the Yamaha RX-V697 transmits Bluetooth at a fixed volume, absolutely relying on volume control at the receiver end. In theory it’s a great idea to be able to pack all this into a single small, black, pebble-shaped object you can slip into a trouser pocket. Great, too, to be able to extract and apply the earbuds without having to go through the conventional five minute cable untangling ritual. The catch is that you’re juggling one small and two tiny objects that are easy to lose, and if you lose any one of them you’re done. I’ve asked Optoma about replacement prices for any of the components, and this appears to be something they haven’t thought about yet. If you are, or are prepared to become, someone able to treat these £200 earbuds with diligent watchfulness against loss (I’m not sure I qualify) they’re an excellent, tangle-free solution to the problem of music-on-the-move. They won’t fall out at the gym, or get waterlogged on the beach. Returned to their case when not in use, they should give you an all-day charge, delivering very clean, CD quality sound. The official Amazon UK price is £195. But I discovered that (at the time of writing, at least) they can be bought directly from Amazon’s US site for $149 (about £110) with free shipping to the UK. There might be a VAT catch here, but even so that would still put the price at a bargainous £132.